SEMrush has collaborated with Yext to provide our Listing Management tool to automatically solve all your NAP-related problems. The tool works for businesses based in the United States as well as Australia. Keeping your business listings consistent and correct across the internet is the basis of local SEO. Putting your info on your website is not enough, because Google uses multiple directories to cross-check and validate the name, address, phone number (NAP), and other business data. That is why you need to manage your business data on various maps, apps, search engines, social networks, and vertical directories like Yelp, TripAdvisor, Foursquare, and the like. That’s it! Now click "Check listings." Your business is present in the directory, the data is correct, and no further action is needed. Your business is present in the directory, but its data is incorrect (discrepancies are highlighted in orange). The tool can fix this for you. Your business is not present in the directory, and you are missing out on potential customers. The tool can add it. The directory with the listing does not respond at the moment, or directory does not support that kind of business (e.g. Tripadvisor only accepts businesses in the Hospitality area). This step requires you to purchase a location. Our paid subscribers get to employ Listing Management for $20 per location per month. You can purchase up to 24 locations for a single brand or business. Next, the tool will ask you for your brand name and the category of your business. Adding a brand name will help the tool trace your business in the directories, and will also help you to manage multiple locations for the same business. 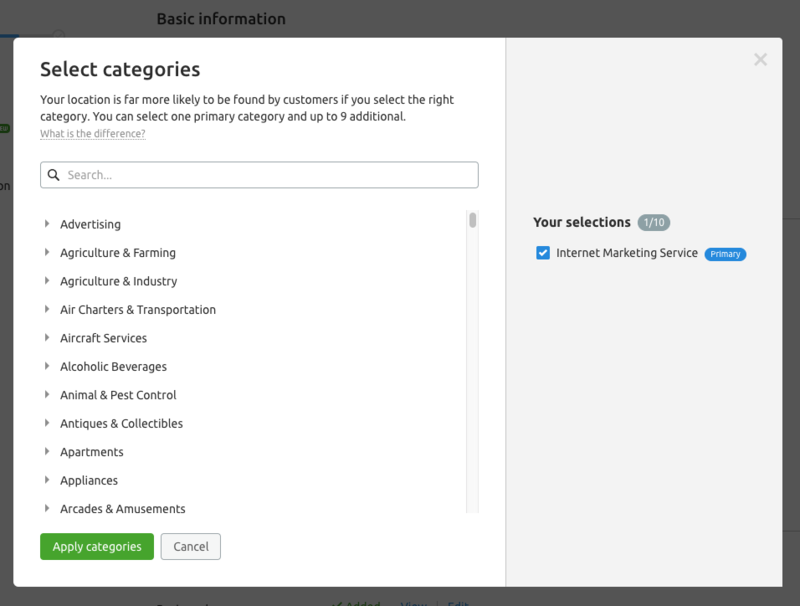 Select the business category from the drop-down that is the most relevant to your product or service. Pay attention to all of the options, as choosing the right category will help your customers find you. Unavailable – the directory with the listing does not respond at the moment, or directory does not support that kind of business (e.g. Tripadvisor only accepts businesses in Hospitality area). To add another location click the green button at the top right of the screen. 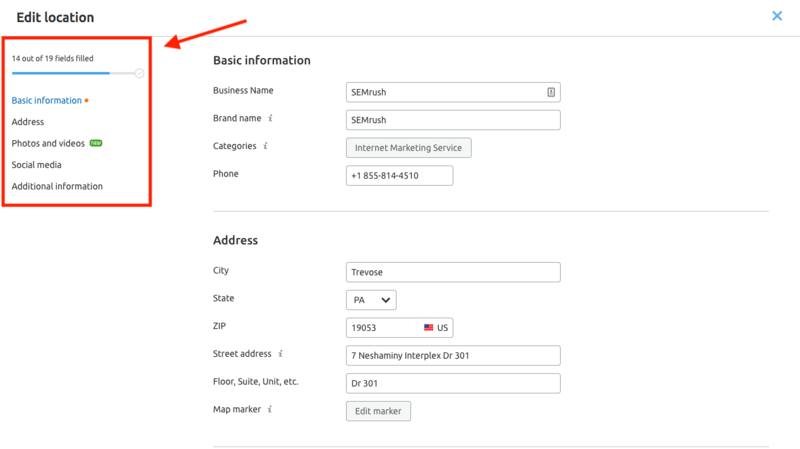 To edit business data, in the top right corner of the location card click where it says "Edit info" in blue. If you ever need to change your business data, just edit it in the input fields, and click Save changes. Editing your information is broken down into 5 different categories. These include Basic Information, Address, Photos and Videos, Social Media and then an entire area for Additional Information. Adding more information about your business will increase your relevancy and traffic, and help your customers decide in your favor. Basic Information includes your business name, brand name, category, and phone number. It's important to make sure you select the most relevant category for your product or service in the drop-down. Pay attention to all of the options, as choosing the right category will help your customers find you. Under Address, you can edit all of the information for your companies address including editing where your location is pinned on a map. Photos and videos are where you can add any relevant photos or videos, as well as your business logo. If you do decide to add any photos or videos keep in mind it can take up to 24 hours before they are distributed. If you change your Twitter or Instagram handles, these can be edited in the social media section. 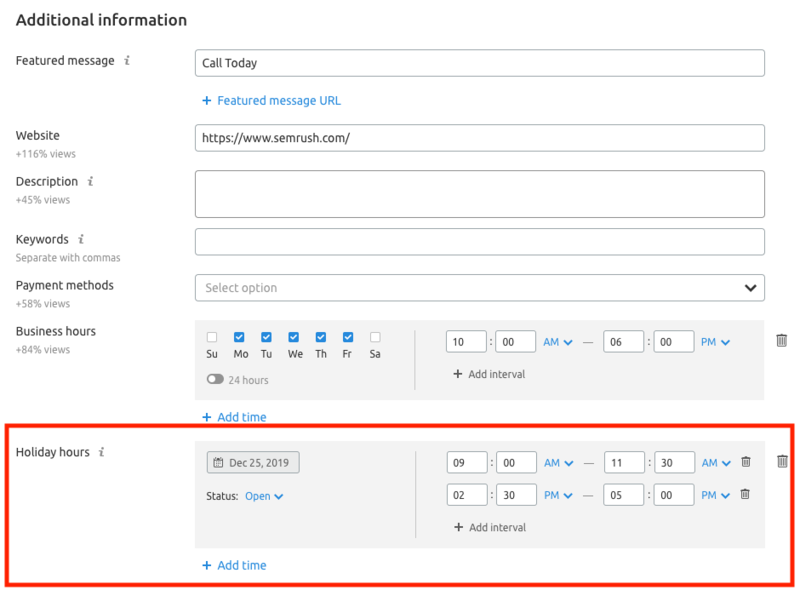 Featured message with URL — a 50-character clickable message that appears in the listings. You can use it to highlight and promote special offers or services. Website — A lot of your customers would want to explore your website before the visit, so providing a link is a must. Description — Write a few sentences to pitch the product or services you provide. Keywords — These keywords appear at the bottom of your description, and serve as quick pointers for your customers. E.g. “Pet-friendly”, “Cozy”, “Vegetarian”, etc. Payment methods — Here you can specify what type of payment your business accepts. If you are not accepting certain payment methods, it can cause a lot of inconvenience to your customers. So specifying available options beforehand is a good practice for keeping your customers happy. Business hours — Specify the hours and day in which your company is open to the public. Holiday Hours --- You can add business hours for holidays. You can choose up to 30 specific days throughout the year to designate as a holiday. You can set intervals for closing and reopening at certain times if applicable. In addition, to set intervals, you can set a preset status: open, closed, 24 hours, or regular hours. 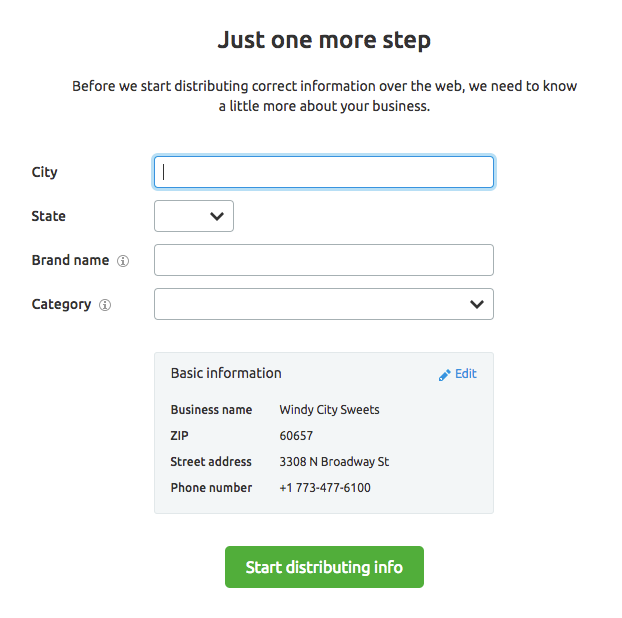 If you are promoting a local business, you might want to learn about the Position Tracking tool, which allows you to monitor your search engine performance on a ZIP code level, discover your competitors, and see how well you do in local packs. You will see if you have any duplicate listings in the Duplicates section. These statuses are possible duplicates, processing, suppressed and unable to suppress. Duplicate suppression keeps your listings as consistent as possible and ensures maximum visibility for your business. If we find any possible duplicates you can decide to suppress it or if it is not a duplicate you can mark it as such. The Reviews report lets you monitor your business reputation and take timely measures to maintain it. In this tab, you’ll see all available reviews of your listing in all directories starting from the most recent. You can read any review right from the tool. To answer it or just learn more, press the “Open review” button and the system will take you right to the directory where the review is located. 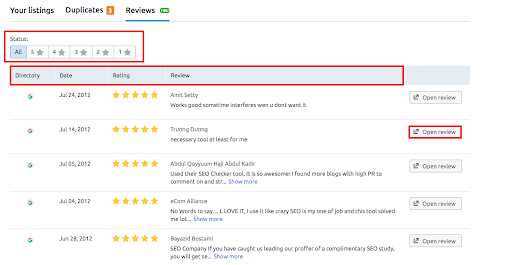 To focus on more positive or more negative reviews (depending on your current reputation management goals), choose the corresponding status at the top of the menu.